The Gongniu-Bull Group, an emerging international collective of designers and engineers, is honored to receive the prestigious 2017 iF Design Award for their new generation of copper automotive USB car chargers. The iF Design Awards, founded by German design institute iF Industry Forum Design, are part of a celebrated design competition determined to revitalize industrial design and foster innovative technological advancements. The iF Design Award is recognized as a global symbol of design excellence, and for the Bull Group, highlights their position as an established talent in the industry. Current research forecasts the global market for portable battery chargers to reach US$16 billion by 2020, driven in part by the exponential growth of the mobile telecommunications industry. Already a household name in China for their comprehensive electrical connection solutions, Bull Group’s entry into the global market signals their commitment to innovative technology. To that end, they have crafted their best car charger to date in order to meet the needs of the increasingly high-tech consumer. Their award-winning copper automotive USB charger is distinguished by its personalized appearance and unrivaled user experience. The Gongniu car charger is manufactured with high-precision technology and complex finishing process, including pearl plating, polishing, and laser carving. The resulting brass and pearl argentine finish houses advanced technology in a luxurious high-fashion package. Not just concerned with form, the Gongniu car charger offers enhanced functionality as well. It comes standard with multiple safety protections, including surge protection and temperature and voltage control. The built-in blue LED power indicator is multifunctional, acting as both power indicator and illumination device, making it easy to locate USB ports at night. 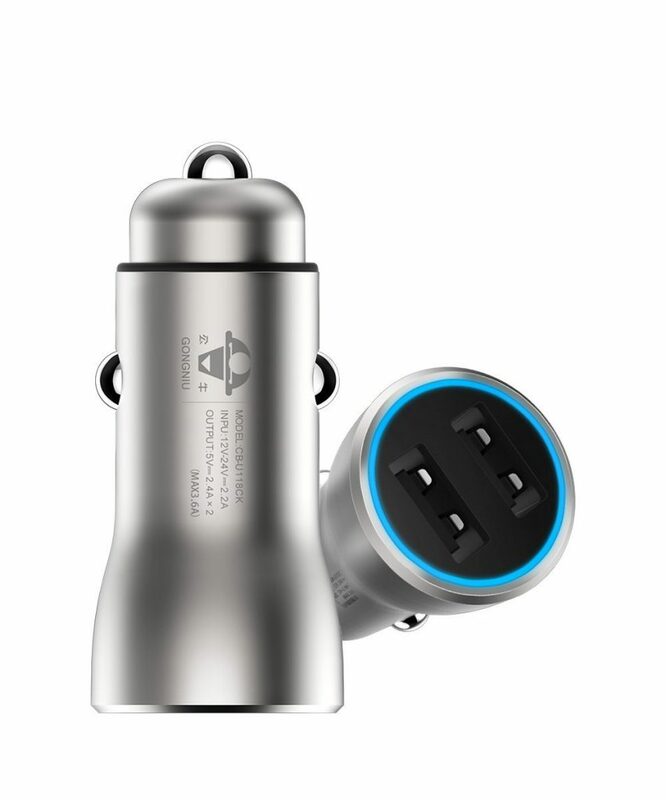 Backed by the newest IQ chip from Texas Instruments, the Gongniu car charger provides rapid charge rates, dual USB efficiency and optimal charging solutions for most devices, including iPhone, Android, and Samsung. Durable, fashion-forward, and fast, the 2017 iF Design Award-winning car charger is the perfect choice for daily car travel. With annual sales of more than $5 billion, the Gongniu-Bull Group is a leading international group corporation composed of skilled designers and engineers. Their driving mission is to deliver an improved consumer experience resulting in an intelligent, comfortable and convenient life. Gongniu enjoys an exceptional reputation as a renowned brand in China, with over half the market share in various categories. The company is proud to serve millions of Chinese, providing customers with all-inclusive electrical connection solutions, smart products, and quality services. Bull Group’s advanced R&D system composed of technical experts and sophisticated hardware cements their status as a leader in industrial design. Other awards include 2017 iF Forum Design Award for the Gongniu Magic Cube Socket; 2016 iF Forum Design winner for the Gongniu Rain Roof Socket; the 2015 German Red Dot Design Award for the Gongniu Surge Protector; and ten-time recipient of the China Red Star Design Award, China’s premier design award. The future is bright for the Gongniu-Bull Group as they explore the US markets, determined to deliver the same quality and innovation to a new generation of users. What are the Benefits of Using a Man Down Alarm in Your Security System?